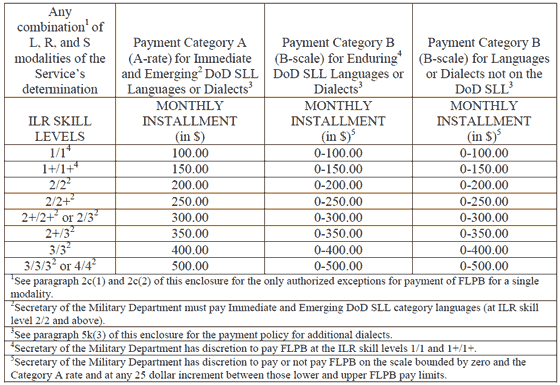 Entitlement to Foreign Language Proficiency Pay (FLPP) is established for officers and enlisted members receiving basic pay and certified by the individual service secretary to be proficient in foreign language. Service members must be deemed proficient in a combination of at least two of the three modalities—Listening (L), Reading (R), and Speaking (S)— of their Service’s discretion, in a language on the Department of Defense’s Strategic Language List (DoD SLL). Depending on how they test, servicemen and women can earn between $100 and $500 per month for a single foreign language or dialect. FLPP is payable in addition to all other pay and allowances, but members are not authorized to receive both FLPP I (Career Linguist) and FLPP II (Non-Career) simultaneously. They may, however, receive a bonus for aptitude in multiple languages, provided the amount does not exceed the limit, which is $1,000 per month/$12,000 annually. Members of the Selected Reserve who meet the same requirements but perform a partial, qualifying year of service can also receive the bonus pay with their monthly amount prorated.